Our latest data shows that East Timor spent $33,700,000 on their military in 2012 which amounted to 0.7% of the country's GDP that year. Check out the chart below for more Timorese military budget data. We can only publish the past 12 years, but SIPRI has data as far back as 1988 on their site. SIPRI Footnote: Estimates of Timor Leste's GDP from the IMF were revised very substantially upwards in 2012 due to the inclusion of oil and gas revenues that were previously excluded. 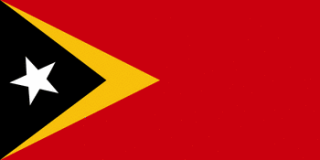 As a result, the figures for Timor Leste's military spending as a share of GDP are much lower than those shown in previous editions of the SIPRI Yearbook or in the online database. 18 years of age for voluntary military service; 18-month service obligation; no conscription but, as of May 2013, introduction of conscription was under discussion.